Come to a relaxing mountain setting with a sweeping view across a peaceful meadow, just a short walk across the fields from the Trinity River. The riverfront property is at the end of a quiet country road, located just ten miles south of historic Gold Rush Town of Weaverville. The Ranch is a great place to visit in all seasons of the year! Your family can enjoy time together, with each person choosing their own level of activity, whether it be fishing, boating, birdwatching, walking, gold-panning, or reading. A good spot from which to take trips to the nearby Trinity Alps, Lewiston or Trinity Lakes, or just stick close to the Ranch, the river, and the quiet. Mt. Shasta is to the northeast, Eureka on the coast and a beautiful road trip to the west, Mt. Lassen to the east. The town of Weaverville has some good restaurants, a museum & various historical gold mining sites. The fishing is great, the peacefulness complete, and there's no traffic! Dennis has long enjoyed the Trinity Alps area for it's solitude, quiet, great hiking spots, gold-panning, lack of traffic, and weather. Lorrie enjoys it for the river and lake swimming, kayaking, and bird-watching. We have a house outside of Weaverville where we vacation when we're not working 4 1/2 hours away in San Francisco. Remote, quiet, no traffic, Trinity Alps are a relatively unknown gem compared to Tahoe or Yosemite. 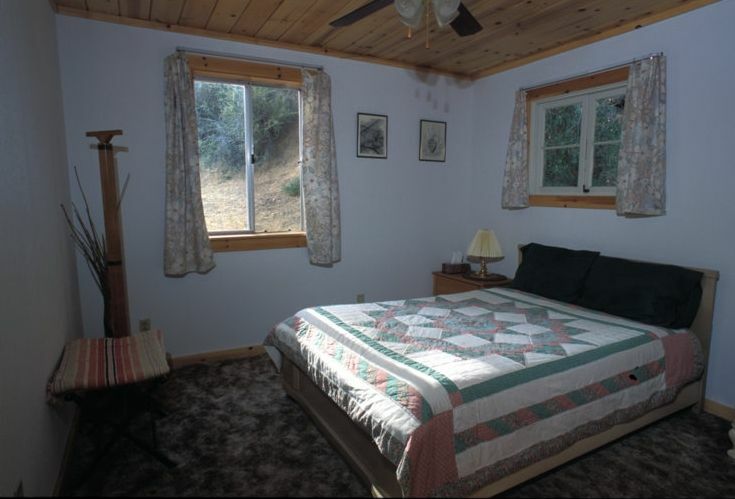 benefits of the ranch are the quiet, night stars, great view of a mountain valley, direct access to the Trinity River, easy drive to the historic town of Weaverville. There is a master bath that connect to the master bedroom.There is another bathroom towards rear of house that services back 2 bedrooms. Secluded, quiet ranch house. Easy to get to Weaverville, but peaceful & remote right around the ranch & river area. Great stars at night. Lakes nearby (no view from ranch) include Lewiston for fihing & kayaking and swimming, Trinity Lake for viewing, Whiskeytown Lake closer to Redding for boating, water-skiing, swimming. Across the pasture of the Arttus Ranch is the Trinity River. One can walk through our pasture to 'our slice' of the waterfront & fish or daydream or skip rocks from there. The house has a swamp-cooler, which is the rural equivalent of an air conditioner. It's very effective. chairs, TV, books, window view of mountains! Very comfortable & efficient kitchen, lots of room for helpers and observers! We have had guests use their wheelchairs, a little tight but do-able. There are 3 steps to access back of house, 4 steps to access front of house. Perfect for walkers. Front & Back Porches, brief walk to Trinity River across our pasture, quiet & sheltered, very private. How about some gold mining? There was a lot of rain in the Trinity Alps, as there was in the rest of California at the time. We were prepared, though, & still went fishing in the Trinity River (you can walk to it right from the house across the field) & boating at the Trinity Lake. Nice country driving, no traffic, great stars, very quiet. Would like to take some long bicycle rides next time. What ever the weather, the Arttus Ranch is a great placer to land. Comfortable, private, quiet! We’ll be back again! The kids enjoy the Trinity River for swimming in the summer, the adults enjoy it for fishing in the late fall. Everyone enjoys driving around & looking at the lakes and mountains. As always the place was tidy n clean. We had an issue with the heater pilot light. I talked to the owner and it was dealt with right away. We enjoyed our stay at your cabin and thought it was an excellent choice for our group. The cabin was in great shape, clean and awesome! We will try and rent it every year. Nice place, tucked away on a quiet but twisty road. Clean and comfortable accommodatiions. Owners were very helpful and responsive. Place is comfortable and well maintained. Had an issue with low water pressure and Owner was there next morning to take care of things. Would recommend it to others contemplating a stay in the area. We had an excellent stay at this cute cabin. We caught some rainy weather but made the most of our stay by watching old movies and listening to the frogs at night in the pond across the street. The cabin was very warm even in the cold rainy weather. A perfect retreat for our family of five. Shasta-Trinity National Recreation area for waterfall & boating & hiking, Weaverville Basin Trail System for biking, Trinity River for fishing, Turtle Bay Exploration Park and Sundial Bridge in Redding for nature education and walking, Lewiston Lake & Trinity Lake for fishing and boating, Joss House State Park in Weaverville for historic Chinese miner info during the gold rush. You can also try panning for gold on our riverfront property. Bigfoot Rafting in Willow Creek for family rafting, farmer's market in Weaverville & Hayfork, Art Cruise in Weaverville on the first Saturday of each month.